Finding money is always a thrill. And getting cash back when you shop at your favorite retailers – without having to change your spending habits – it's just like that. 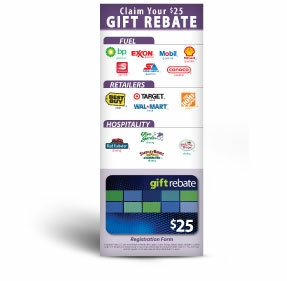 With this rebate program, you can turn your everyday purchases into money back in your pocket. This rebate can be used for purchases at a variety of retail, gasoline and dining outlets in the United States and Canada. This certificate can garner a single rebate up to $25, based on the amount spent – as indicated by the total of the submitted receipt. Simply complete and send in your certificate to register. You'll receive a voucher to complete – including your selected retail outlet – and return, along with your original receipt. All you need to do is fill out and return your registration card. When you receive your voucher, simply shop at one of the retailers listed below. Mail the voucher to International Rebates along with your original receipt. Please allow 6-8 weeks for processing of rebate checks. *Grand Incentives assumes no liability in trademark and/or copyright disputes. The logos, insignias, designs and trademarks which are shown in this product - and any textual references to same - are reproduced only to show examples of hotels used by Grand Incentives. They are not to be construed as product or brand name endorsements by or for the trademark owners. We can give you more detailed information on how it works and how we can help make your goals become a reality.